If you think there’s a problem with your mattress, don’t lose sleep over it. We’ve got you covered. Here’s a simple way to determine the length of your warranty and its terms. Simply match the Warranty Code from your mattress’ law tag with the same code on the warranty schedule below. No-charge coverage during total limited warranty period. No worries, you can download a PDF of the warranty card below. We always recommend visiting our Help Desk section first to see if you can get answers there. 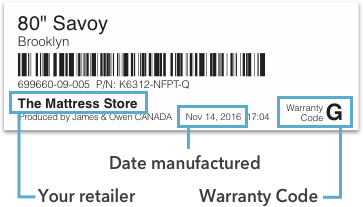 If you still need to file a warranty claim, just follow the steps below to help your retailer resolve the issue. They will in turn file the warranty claim and handle the pickup and delivery of a replacement mattress. Photo document any issues with the mattress (if possible). Also make sure you capture photos of your mattresses foundation. If you have a boxspring, take pictures of the boxspring and the support frame. If you don’t have a boxspring, be sure to capture photos of the beds base. It will help your retailer isolate the issue. Take a photo of the law tag. Most of your mattresses information is there. This greatly helps your retailer file the claim. If your mattress meets James & Owen’s warranty requirements, a replacement will be ordered. If your mattress model is no longer available, we will substitute with a new model of equal value (at the time of purchase). *Retailers may have different policies. It’s always best to contact your retailer and have your original bill of sale handy.